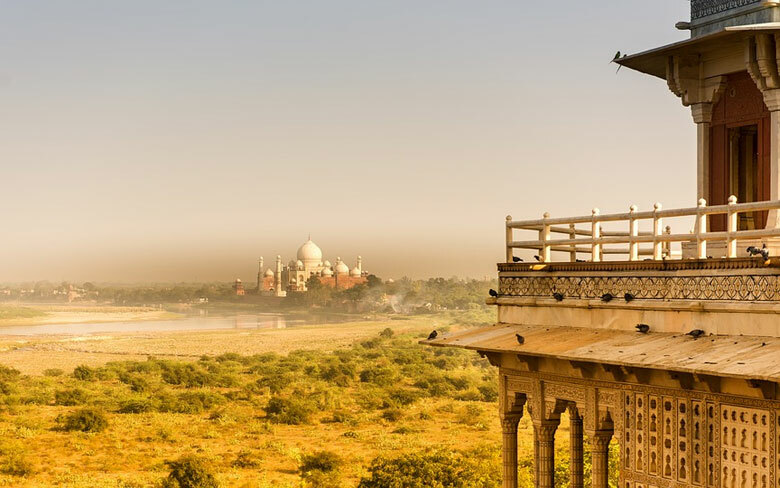 Along the banks of the muddy Yamuna, and in the heart of the crowded city of Agra, stands India’s most famous tourist destination, the sublime Taj Mahal. For almost every first-time visitor, the sight of that mesmerizing white marble beauty and the feeling of awe that follows stays long after one’s visit is over. This legendary symbol of love, called ‘a teardrop on the cheek of time’ by Rabindranath Tagore, was Mughal emperor Shahjahan’s last gift to his beloved wife, Mumtaz Mahal; a gift so unique, so beautiful and so painstakingly elaborate that it took 22 years (1631-1653), 22,000 artisans and supposedly about 32 crores to be built! 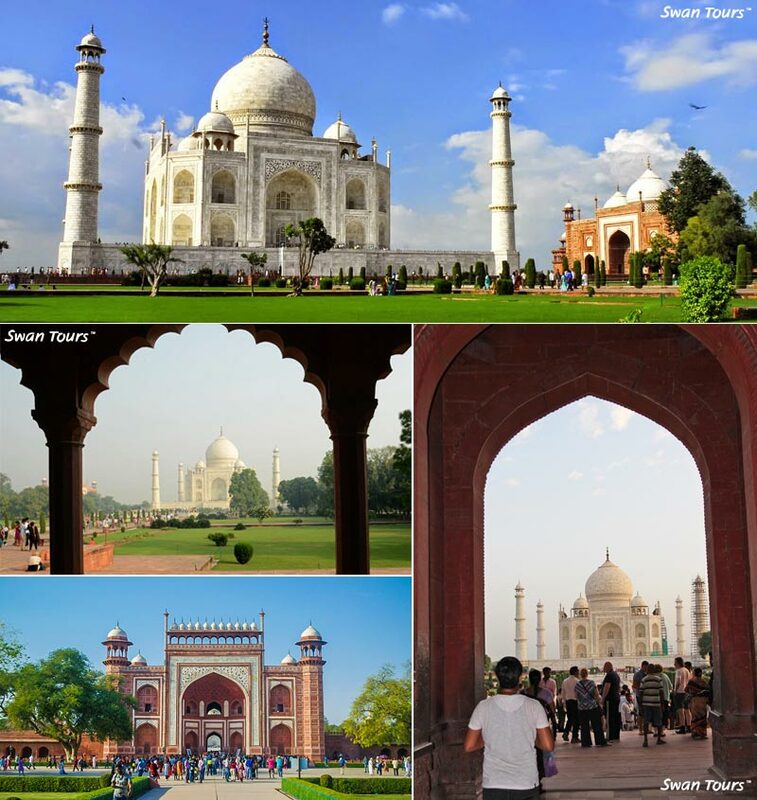 White marble from Makrana, Rajasthan, black marble from Charkoh, yellow marble and rockspar from the Narmada and red sandstone from the nearby city of Sikri were used to build the Taj Mahal. The exquisite pictra dura has semi-precious gems like jasper, garnet, lapis lazuli, sapphire, onyx, turquoise and many more. The most accomplished craftsmen, calligraphers, stone carvers and architects from India, Persia and Turkey came together to build this incredible monument, while the emperor himself is said to have conceptualized the entire complex. Though there is no official record of this, it is largely believed that Ustad Ahmed Lahori, was chief architect of both the Taj and Jama Masjid in Delhi. As one enters through the magnificent 30-metre high red sandstone gateway, one often pauses in amazed disbelief, for the sight that greets the eye is truly mesmerizing. 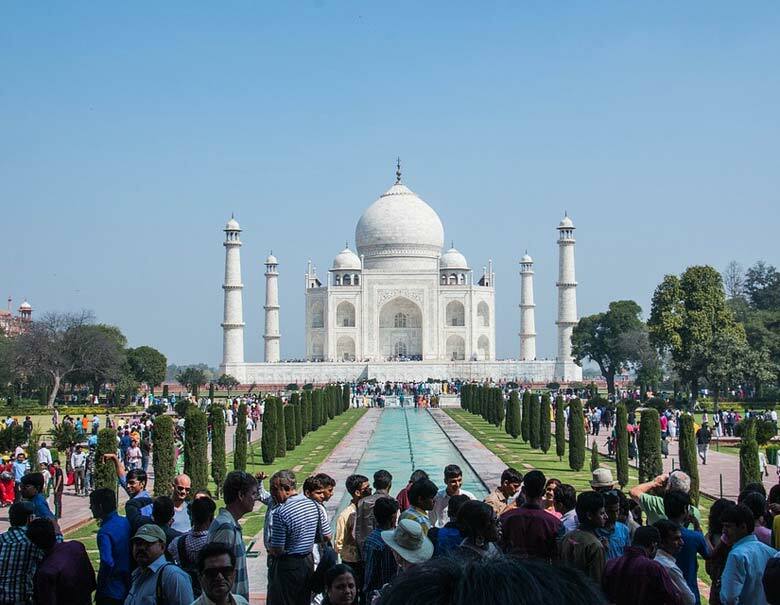 Rising against the backdrop of a brilliant blue north Indian sky is a lush green garden, a long rectangular stream and the exquisite Taj Mahal. Unlike other Islamic tombs, the Taj stands at one end of the garden, rather than at its centre. Standing on a 6-metre high, white marble plinth, the tomb has four rising minarets at each corner. Perfectly symmetrical, the height of the tomb, without its finial and including the platform, is equal to each side of its plan perimeter; thereby forming a perfect cube. The bulbous, perfectly balanced double dome rises to a height of 45 m. Taj Mahal as a whole rises 75 m high, and is, in fact, taller than the Qutb Minar in Delhi. The main structure has tour clthattris flanking and balancing the high drum and giving it additional height. The red sandstone mosque and mehman Altana, at opposite ends of the tomb, are perfectly symmetrical, and against the pure white backdrop of the Taj, make for a visual treat. The octagonal central hall has four smaller or halls around it and is decorated with it magnificent inlay and dado panels in high relief. This has false crypts, below which are rai the actual tombs of Mumtaz and Shahjahan, for who was also buried here after his death in Di 1666. Not open to the public, in true Mughal no: style, these tombs lie in a chamber below the false tombs. Inlayed with semi-precious and precious stones, they are remarkable for their intricate pietra dura. The gardens cover a total area of 90,000 sq m and are said to be designed the way Shahjahan assumed Mumtaz’s heavenly abode to be. With colourful flower beds, and dotted with fountains and streams, these gardens are like paradise indeed! The Taj changes its moods with the seasons and different times of day. It can be solid and earthbound, fragile and ethereal, white amber, grey and gold. Its many faces display the seductive power of architecture at its best. 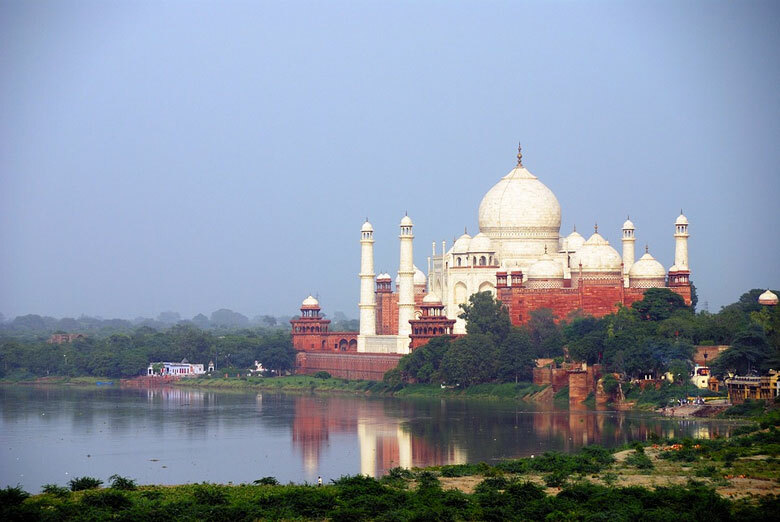 Across the Yamuna, opposite the Taj is the beautiful Mehtab Bagh, literally the Garden of Moonlight. It is said that the garden’s location allowed for a splendid view of the Taj at night, and the emperor would often come here to gaze at his beloved’s tomb. Soamibagh (in Dayalbagh area), only 10 kilometers from Agra Fort, is the headquarters of the Radhasoami Satsang Movement, founded in 1861 by Shiv Dayal Sahib whose samadhi is set in the midst of a beautiful garden, and is run and managed by the followers of the Radhasoami movement. The society also houses the Dayalbagh Educational Institute, Radhasoami Urban Cooperative Bank, Dayalbagh Mahila Bank, Dayalbagh Printing Press, as well as a large housing complex. For more information on Delhi Agra Jaipur tour packages contact Swan Tours, one of the leading travel agents in Connaught place New Delhi India.